I have a 1995 268 Islander which is long over due for cockpit deck drain hose replacements . Unfortunately there is no way (that I can figure) to access the starboard side without cutting an access plate into the deck. In fact the port side may be easier to do if I cut into the deck as well. I was wondering if anyone had photos, recommendations, lessons learned for this project. I am guessing the configuration would be quite similar on the Sailfish and Bimini as well as a few other models. Also the bottom of my deck drain thru hulls are under water so I was planning on going with bronze rather than stainless. Any one have recommendation on how to properly bond these. Since there's a rubber hose attached to the thru-hull (and it's not wired into an electrical system like a seacock for a macerator might be), it's already isolated from everything else. No need to bond. If you're still worried about it, use Marelon, but again, no need to bond the bronze thru-hull. And, yes, do not use stainless below the waterline. Thanks for the clarification on the bonding question. I don't think I want go with marelon. Good question Dan. I just pulled my livewell on my 272 to access my oil tanks for removal/cleaning/filers, saw my port drain hoses not looking too good and immediately started wondering about the starboard side, an impossibility, would LOVE to know what Grady has to say about this. I don't think I want go with marelon. I'm not saying this to push you towards using Marelon, but don't shy away from it if you're thinking it's an inferior product. Marelon is a VERY good product. would LOVE to know what Grady has to say about this. Replaced all my Thru Hulls and Hoses and the 90 Degree drain fitting as well. For me, was pretty easy to get to on the older sailfish model design. Just removed the back panel that goes across the entire back and everything was accessible. The hoses were not that bad of shape for their age, but I was mostly after replacing the plastic Thru Hulls with SS since I trailer. The deck drains were not possible to get since Grady basically took a straight threaded flush plastic drain and cut the threads shorter and then put on a 90 degree threaded hose barb fitting since no one apparently made a complete fitting like this back in those years. But they sent me new one's that are all one piece that I installed. Gained a bit of angle with the new ones for better draining. Good luck as I know accessing some of these areas on the newer models is very difficult. 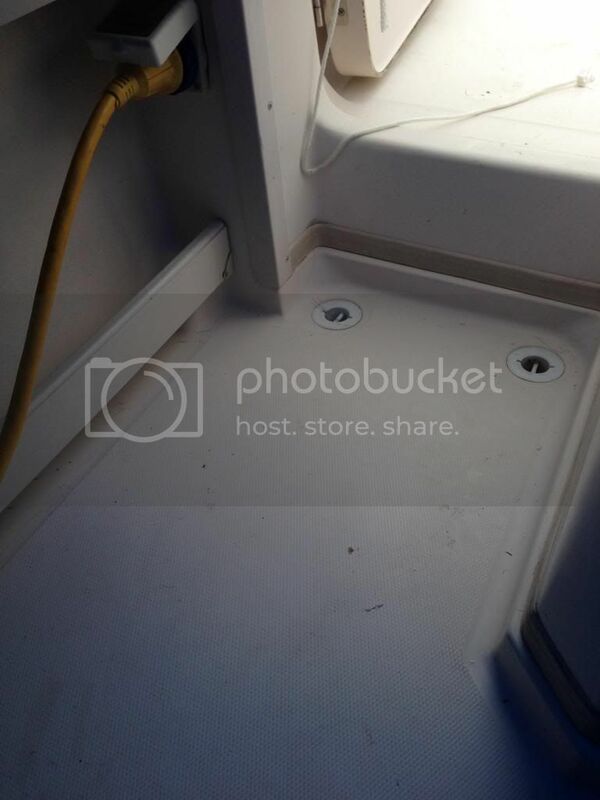 95 Islander: I completed the port side thru hulls and hoses. I used the fuel hose as was originally used. I removed the trash can and hung upside down inside the opening. You just need to right yourself occasionally and let the blood flow out of the head. I am looking at completing the starboard this spring as my marlon scupper is cracked. I was thinking about cutting an access hole in the vertical step riser below the transom door. I am thinking a four inch screw- in cover plate will cover. I am sure they will say that. I wrote them a note, will see. But since I cannot even see them and know they are a few feet away and even an orangutan couldn't do it, I want to see how big a hole they make and where to do it. Roberth I wish GW would have kept with your style access design, as the newer design offers absolutely no access on the stbd side. 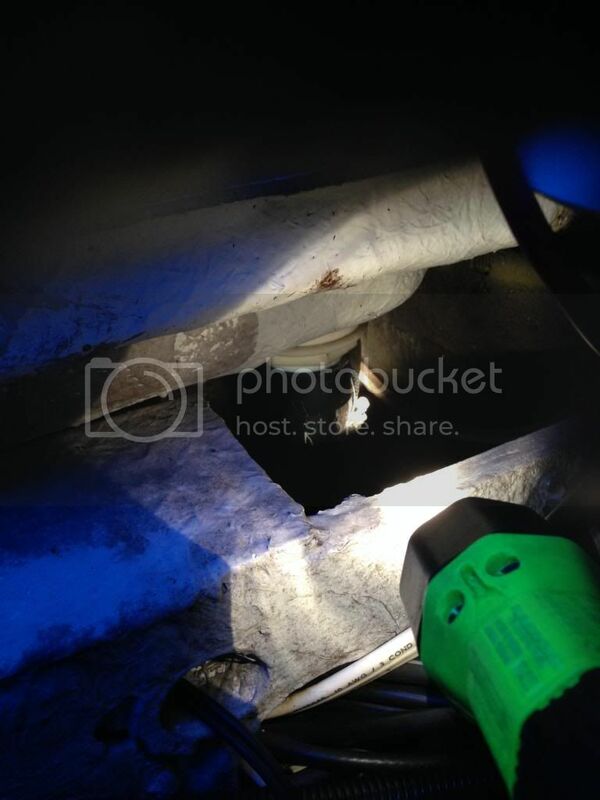 I can see the drain hoses on the port side and they are badly cracked/ dry rotted, definitely in need of replacement. 1st Grady, I like your idea of using the vertical step riser to keep from cutting a hole the deck, I think I may have to go with a larger oval Bomar type access plate to ensure I had enough room to contort my arm to fight with the removal/ installation of the hoses & fittings. How much trouble did the port side give you? fishbust, please post what you get back from GW I'm sure I'm not the only one curious. Agree Dan, I would think someone on here has already done this once and can share where to open it up. Port side wasn't too bad except for being upside down for a while. It came apart pretty easily. Have a helper to install the thru hulls. I used 4200 as a sealant inside and out on the thru hulls. Double clamp and reverse the hose clamps. I am hoping a 4 inch hole works for the starboard side. I have not heard anything back yet but will surely post what I get. In the meantime, I do not think it is a great idea to go cutting without knowing if it is in exactly the right place to accomplish our mission. Grady should be able to advise exactly where and how large to cut to gain access for the job. As Roberth says, lots of folks must have done it already or a lot of grady's would have sunk. Mine is a 2000 and I do not like the looks of my port side hoses at all. Safe to assume the starboard side is in exactly the same condition, as well as other places. There sure are a lot of holes in these boats! A pic would help us understand the proposed area you need to cut to access. Can you get behind where you think and see if there are any obstacles or irregular areas that would cause you issue? If not, then I would just cut the hole and access it, the put in a new deck plate. Not sure 4" would be big enough though. That is pretty tight if you need to get in there and push the hoses on and tighten clamps, etc. Robert, exactly where to cut the hole and size is unknown because from the center of the boat you cannot see anything over there, that is why the question to Grady as this cannot be the first time the subject came up or a lot of grady's would have gone under from failed hoses. This is something that needs to be done each decade on all boats, so they must have pictures and templates/measurements-location for this job. It may even need 2 holes to be cut. Either way, I am not trying to reinvent the wheel here, it has been done before on this model and others similar to a 272. Grady has not yet answered me on this issue, so I had to put in a second request. My third request will be a phone call. My first experience with Grady customer service will impact what I buy next time around. Agree and understand. Just thought posting some pics might help some of us recall seeing one like this and provide further assistance. Just give them a call. The Email does not always work and sometimes they told me it does not get through. I have had this same issue with many of the internet web site email responses with other companies over time. For more technical issues, I called Grady and that was the best way to get the help and elaboration is much easier than email. Sorry your in this situation as I know it is frustrating! The euro hull designs are guilty of this situation and I dreaded ever having to have one and not be able to change a simple bilge pump without having to hire an acrobat to do the job, not to mention the needed repairs and maintenance. I really appreciate the older design where we can just remove the back board that spans across the entire width of the transom and access everything. I wish they would get back to that design. Now that they have the nice fancy foldup seating, it would not be necessary for them to glass in a seat and instead give easy access again. Good Luck! First one is inboard scupper hose of port side viewing from center access under aft seat. It looks closer than it is, it cannot be reached and this is the closer one. The other cannot be seen. Second pic it will be on the right. Hull fittings are at least another 2 feet away and lower. As you can see, replacement of these hoses is completely impossible without cutting a big access hatch either in front of transom door or behind it, which is what poses the question of where and how big. Yikes, that pic says it all....That looks way tougher than I imagined! Almost wonder if one would approach this from the top in the walk through door area in order to get halfway between the transom and the scuppers. But let's hope someone can show their expertise here or you can get some insight from Grady. I feel for ya on this one! My 95 268 Islander has even less access than that! When I get around to doing the job (hopefully before the summer) I'll try to post some pics. I'm probably just going to cut the deck forward of the deck drains and cover the hole with a plastic access plate. I'm not about to kill myself to maintain a little aesthetics. Eddie from Grady White called me today on the phone to speak in person about my questions. I got my answer on where to cut for access to the area to be able to reach both sides of the hoses for the starboard side scuppers. An access plate needs to be cut/installed behind/aft of the transom door on the horizontal surface. When I eventually do this, I will be installing an Armstrong deck hatch, 100% waterproof, had them on my last boat and never leaked a drop. An additional plate on the side vertical surface may also be beneficial to doing the job. I will only cut this one if necessary. When I do it, photos will be taken and posted to help others. Eddie also advised me that the other pop out deck hatches on the boat are Beckson for my 2000 272 and when I told him I bought a pair of screw on deck plates to replace the pair of pop out plates on my bracket, he said they do recommend doing that for those. I would have loved to see them build those brackets with the Armstrong deck plates. The Armstrong run bigger, so that is the only reason I did not buy them instead of the Beckson for the bracket. So +1 for Grady White customer service, helping me out with a 14 year old boat.